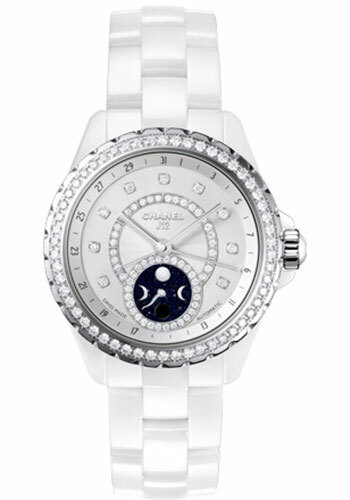 38mm white high-tech ceramic case, solid back, white high-tech bezel set with 54 brilliant-cut diamonds (approx. 1.42 carat), highly scratch-resistant crystal, white dial in opaline glass with guilloché engraving set with 63 brilliant-cut diamonds (approx. 0.34 carat) and an aventurine counter, self-winding movement with hours, minutes, seconds, date and moonphase indicator, approximately 42 hours of power reserve, ceramic bracelet, triple-folding buckle in steel. Water resistant to 50 meters.